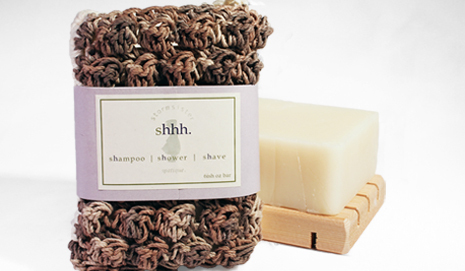 Hand crocheted by a local Minnesota artisan, exclusively for 3waybeauty. Made of 100% organic cotton and hemp - cotton on one side for a soft, sudsy bathing experience and hemp on the other for a skin-softening body exfoliation. (hemp side shown in photo). Allow pouch to dry between uses. All design, manufacturing, and packaging is achieved by the independent|small business community, with a commitment to sustainability. Design and manufacturing, Minnesota; Packaging, Michigan (family-owned, 100% hydro-powered paper mill).